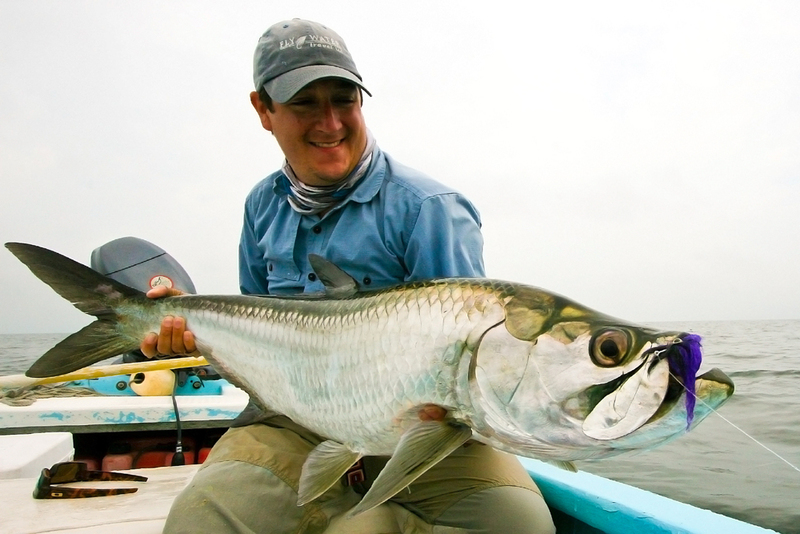 Isla del Sabalo “Island of Tarpon” is truly the new frontier in world-class fly fishing for baby tarpon. 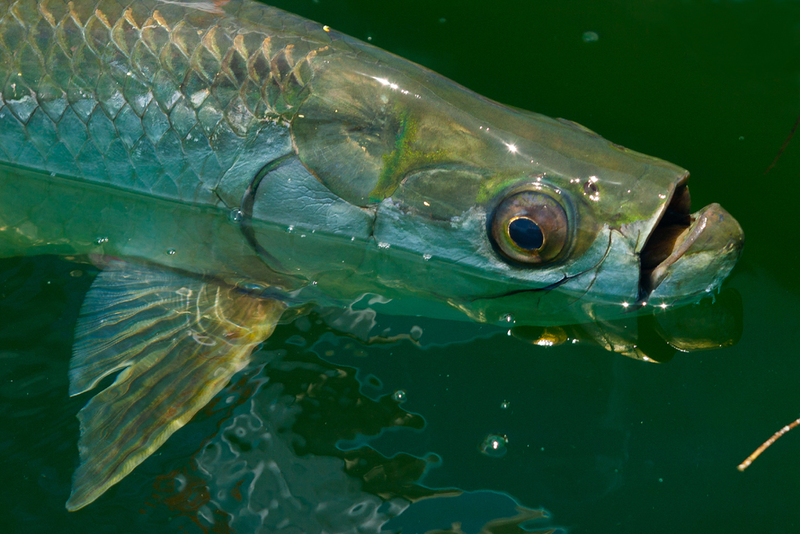 Ranging in size from 5 to 30+ pounds, these tarpon reside in environs of turtle grass flats and mangrove lined lagoons, creeks, and channels. This habitat is also home to snook, snapper and barracuda. The hallmark of this fishery is the gin-clear flats and the amazing network of backcountry lagoons and channels. 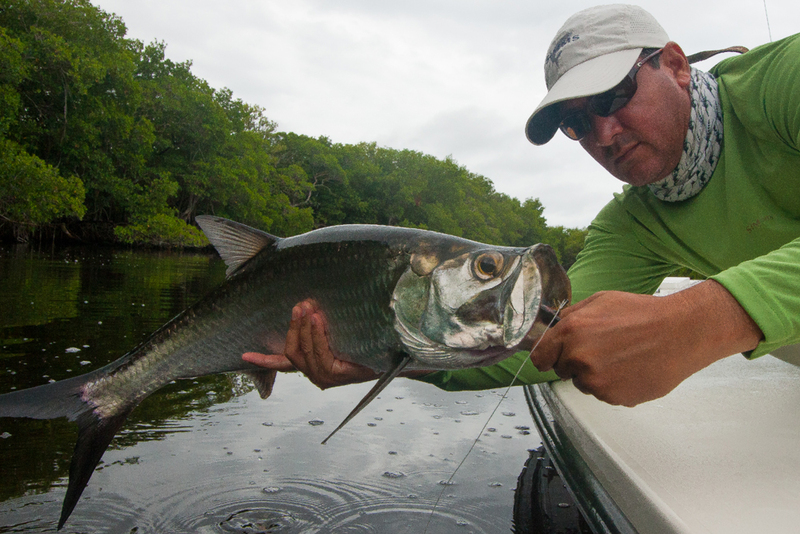 These characteristics make this fishery an incredible rearing ground for these resident baby tarpon. 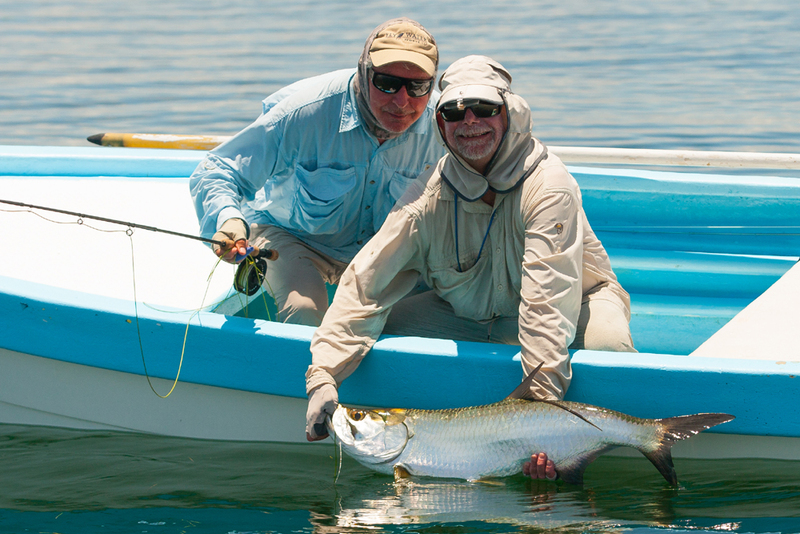 Whether you are sight casting to rolling tarpon on the flats or working the mangroves with your top-water pattern, fly fishing for tarpon at Isla Del Sabalo is a pure adrenaline rush. Isla del Sabalo utilizes spacious 18 foot pangas with an extensive level casting deck. All fly fishing is conducted out of these stealthy, stable, and comfortable fishing platforms. The nearest boundary of the fishery is very close to the lodge and, therefore, only requires a 15 minute boat ride to arrive at some of your fishing areas. The fishery is vast and, therefore, longer runs with the boat are sometimes required. 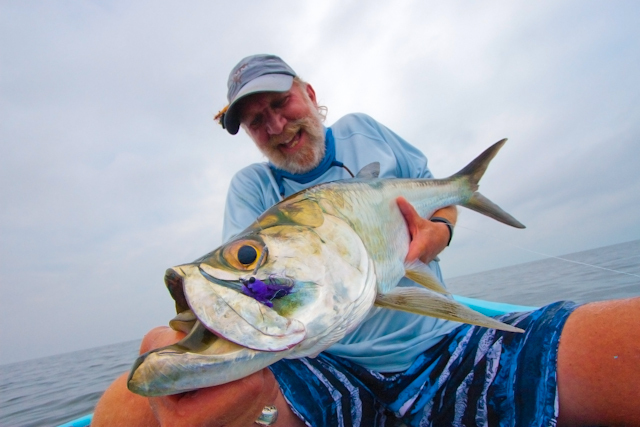 Most anglers prefer to fish 8 to 9 weight rods at Isla del Sabalo. When weather conditions and/or size of fish dictate, a 9 weight rod is the order of the day. One aspect that makes this fishery a pure joy is the ability to pursue these fish with a floating line only. 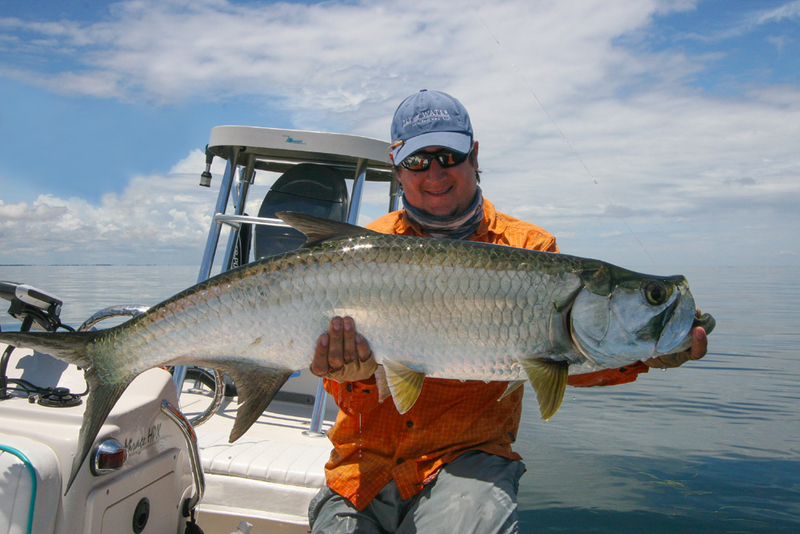 Often shallow water pursuits of tarpon demand lightweight (slow sinking) tarpon flies or top-water offerings. 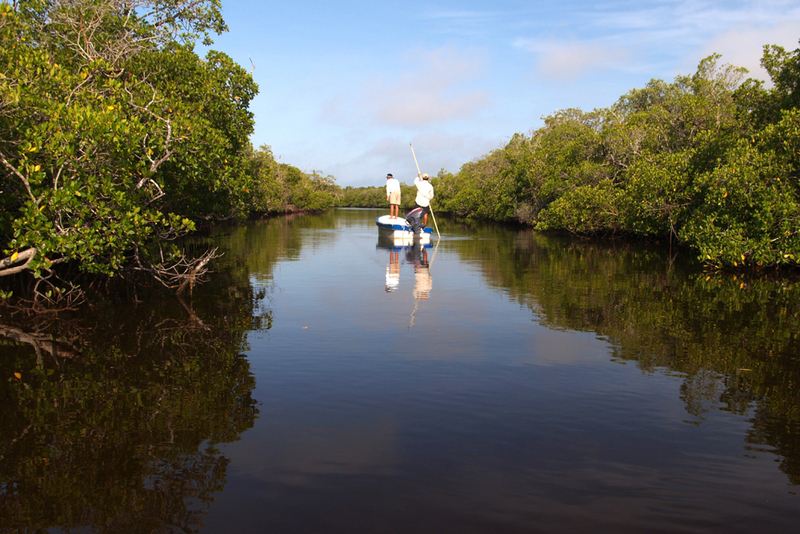 Even in the deeper mangrove-lined channels, a floating line is all that is needed. 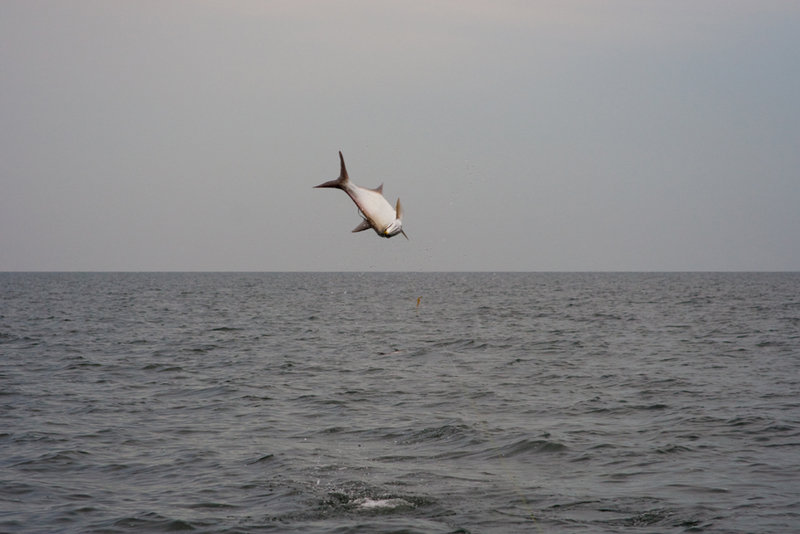 Your fishing program will be based on tides and weather conditions. On some weeks, you will fish from morning through the afternoon. On other weeks, the program may consist of fishing the morning hours, a break mid-day (lunch/”siesta”! 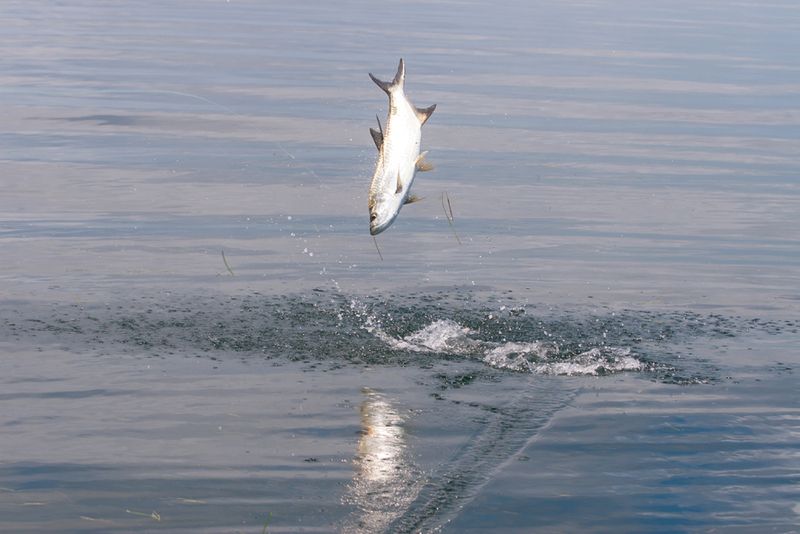 ), and then an evening session of fly fishing for tarpon. Your guide and host will determine the program based on the optimum timing of tides and weather. 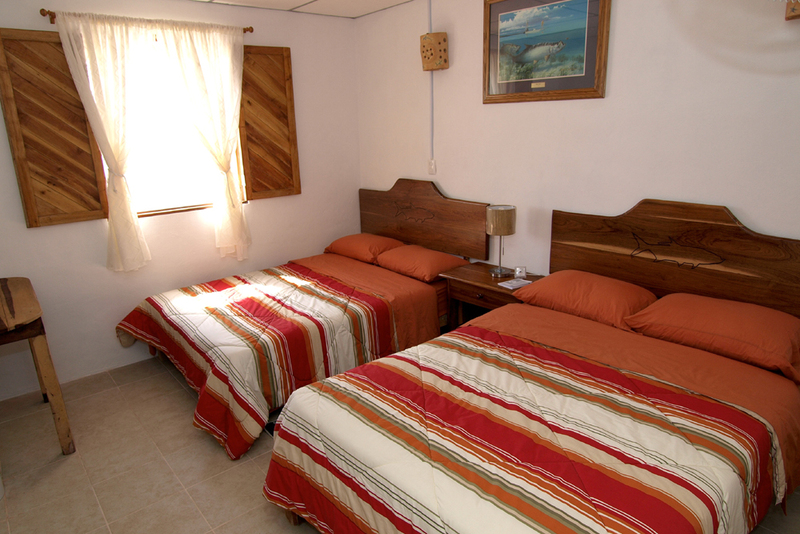 The accommodations at Isla del Sabalo are simple, comfortable, and enriched with traditional Mexican decor. The lodge is on the beach front facing the open ocean, allowing for refreshing cool ocean breezes while you relax at the lodge. Guests stay in ocean front cottages and each spacious guest room is equipped with air-conditioning,fans, and a full private bath with shower (hot and cold water). There is a housekeeping service that cleans the room and replaces, towels, bottled drinking water, cups, and bar soap each day. A unique feature of the property is the beach front “palapa”. 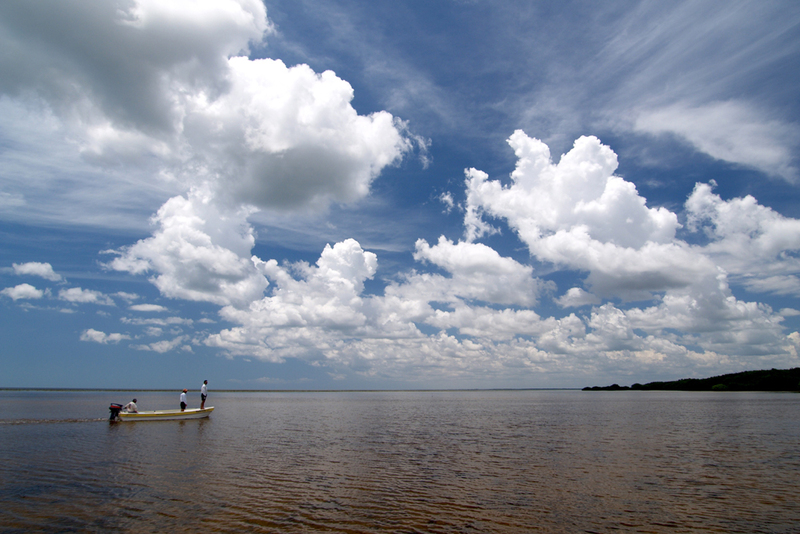 This wonderful area is perfect for relaxing after a long day of chasing Tarpon. Meals are prepared at the dining palapa and served in an open air setting. Breakfast is served at around 5:30AM, so you should be awake, dressed and ready for breakfast by then. Staff usually arrives by 5:00AM to make coffee, so earlier risers can wake up before breakfast. Breakfast includes items such as fresh fruit, eggs, toast, and coffee/juice. Lunches consist of sandwiches, fruit, snacks, and sodas/water. Your lunch is packed by the cook and is taken with you in a cooler. Lunches consist of made-to-order sandwiches, snacks, and assorted beverages. Dinner meals are served at the palapa each evening. Entrees may include chicken, pork, or the catch-of -the-day, fish, shrimp, or even lobster! Enjoy the tasty food and the charming atmosphere of Isla Arena while you dine! To get to Isla Del Sabalo you will need to make flight arrangements into either Merida International Airport (MID). From Merida it is about a 2.5 hour drive to the lodge. After clearing Customs and Immigration, an Isla Del Sabalo representative will greet you outside customs and transfer you by air conditioned van to the lodge. On departure day, after an early breakfast you will be driven approximately 2.5 hours back to Merida for your flight home. Please do not book your flight to depart before 1:00PM. For morning departures, guests can be transported back to Merida after fishing on their last day and stay at a hotel close to the airport.